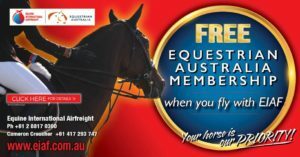 FREE Equestrian Australia membership when you fly with EIAF! We are thrilled to announce our latest campaign, designed to reward and give back to Equestrian Australia members. Book Now - To Redeem You FREE EA Membership! This campaign will benefit all EA members who require the services of international airfreight for their horses. To take advantage of this fantastic offer, simply provide your Equestrian Australia Membership on the ‘request a quote’ form and we will refund the membership fees already paid for the current year. Your refund will be deducted from your final EIAF invoice when securing a flight with us. We are so happy to be a part of the Equestrian Australia community and are pleased to offer airfreight benefits to its members. So, if you’re looking to transport your horse internationally, not only will your horse be our PRIORITY but you’ll also be saving $$$. Members must be a fully financial PAID member of EA or State based EA body to be eligible for membership refund. EA or State based EA body, (including Equestrian Queensland, Equestrian NSW, Equestrian Victoria, Equestrian South Australia, Equestrian Western Australia, Equestrian Northern Territory & Equestrian Tasmania) membership fee will be credited off your quoted price when your horse has been booked into EIAF and your invoice airfreight invoice has been raised. Individuals must provide EIAF with a current EA membership number (which will be cross checked with EA) at the time of booking. Once final invoice has been issued and total amount has been PAID, EIAF can not process a refund. Only EA members who are using the services of EIAF for flying their horses internationally are eligible for a refund of EA membership fee. EA members can only obtain one membership refund per calendar / membership year. Membership refund will only be granted to individual EA memberships. EA membership refund can not be exchanged for cash or used in any other way outside of these terms and conditions. Australian Endurance Horses prove popular in UAE How exactly does a horse travel on a plane?